Anti-Mullerian Hormone (AMH) is produced by the cells that surround developing eggs. Levels of AMH in blood is related to the ovarian reserve and therefore, testing it is very helpful for estimating woman’s ovarian reserve. What is the “ovarian reserve”? Men produce their reproductive cell – the sperm. Their bodies are capable of producing it continually. Unlike men, women already have a predefined supply of eggs when they are born and this amount is for a lifetime. When trying to conceive, it is often important and very helpful to measure the ovarian reserve – how much of an egg supply is still remaining in the woman’s body? For example, women close to menopause will have fewer eggs. Accordingly, their anti-mullerian hormone level in blood will be low and therefore, a lower ovarian reserve will be estimated. Now, we can already guess that the aim of the AMH test is to estimate the number of remaining eggs in woman’s ovaries. 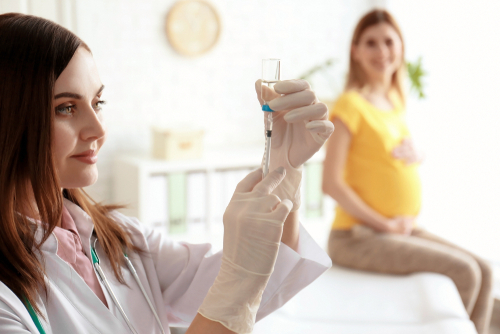 It is oftentimes used by the fertility specialists in order to get an impression about what to expect with the certain types of fertility treatments and how high the probability of a desired outcome is. For example, AMH test can help to determine how suitable/successful a woman will be for a treatment like IVF (In Vitro Fertilization). It is important to note that the AMH test has nothing to do with the actual quality of the eggs – it will measure the quantity only. However, quantity can already be a fair indicator of the expected results. Studies and experience show that women with higher AMH levels tend to have better response to the stimulation during IVF, moreover, they have more eggs to retrieve. Higher amount of eggs is related to the higher success rate because there is more “material” to work with. As for the evaluation of the quality, there are other various indicating factors such as: patient’s age, lifestyle, weight, environment, medical history and so on. AMH levels decrease as women get older. As already mentioned, women are born with a lifetime supply of eggs. Having said that the supply is predefined, we do not necessarily mean that there is a certain amount for each woman – vice versa, the reserve can be dramatically different between females. After the age of 35, the rate at which the amount of eggs decrease in the ovaries, increases rapidly. Because the levels vary so much and are so individual, there is no such thing as an exact figure where the AMH level should stand. The test itself is not a standalone indication of chances of a successful treatment – the result should be discussed together with other fertility test results and the individual situation/goals of the patients. When the AMH test reveals the low levels of the hormone, it is hard to talk about the treatment as there is no way of producing more eggs in woman’s ovaries. Usually, the best option in this case is to consider turning to fertility treatment as soon as possible and discuss all options with the doctor.